What You Should Know Before Buying Blueprints! New House PlansOur newest designs! Special OffersExplore special offers at The House Designers! Realtor ListingLooking for land or needing to sell? Found only on our site! FREE E-Newsletters: Featuring home building tips, innovative product ideas and great home designs! Sign Up! 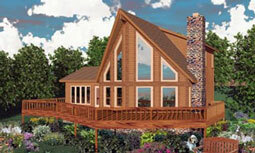 Finding the blueprints for your house is easier than you think with thousands of different home plans to choose from. Most customers want to know how to start their search. The most important items are to determine your budget, the square footage that coordinates with your budget, the number of bedrooms and bathrooms you'll need, and the architectural style that you prefer. As you search, start by using basic search parameters which will give you a greater search results. Small details can make a big difference in the livability of your new home. Make sure your home blueprints include the important items on your wish list. A lot of families look for house design plans that include large kitchens, mud rooms, patios and outdoor kitchens, large master suites with his-and-her closets and bonus spaces like attic areas that can be finished at any time. Make a list of your "must-haves" that you'll want in your house designs. Free home plans are usually a gimmick and anyone offering free home blueprints are usually trying to sell something unscrupulously. It's important that you purchase your blueprints to build a house from a reputable source that sells plans that meet the required residential codes and offers a satisfaction guarantee policy. If you're looking to save money on your house blueprints, try and find home designs that need little or no modification changes. Purchasing plans online saves you time and significant savings. With rising energy costs and global efforts to be energy efficient, adding green, energy efficient details to your home plans and home designs can increase the value of your house significantly. Consider adding an ENERGY STAR package to your house blueprints to have your new home built and certified to ENERGY STAR standards. A common myth is that it's too expensive to build an energy-savings home, but "green" products are becoming the norm and are a lot less expensive than they used to be. Even purchasing energy saving appliances and HVAC systems can greatly reduce your energy consumption. You're ordering direct from the Architects and Designers and not just a third party investment company like most of our competitors. This gets you optimum personal customer service, better value for your dollars and direct contact with the architect or designer for any questions. You'll find a wide variety of home designs in every style and size, receive free shipping, complimentary plan revision consultation and free modification estimates. The Best Plans in One Location! Our designers have personally picked their top-selling, most popular house plans, saving you time by bringing you search results with the best plans available anywhere. Our home designs have been built in every state in the U.S. and in 56 countries around the world and come with a 100% satisfaction guarantee. Be confident you’re purchasing from a trust-worthy company who has strict requirements for the plans sold on this site and who is the exclusive house plan supplier to both Better Homes and Gardens and Professional Builder. The House Designers® offers America’s most popular, ready-made construction blueprints that builders prefer with lots of photography and beautiful color renderings. Search through our extensive collection of designs that have been organized into architectural styles & specialty collections. We also offer detailed information about each plan, including more color photos of interiors and more exterior and rear views than any other website. Photographs show you how a home was built by different clients who easily customized their pre-drawn home plan to fit their needs, budget and lot. At a fraction of the cost of a custom drawn floor plan, find the best house blueprints from our extensive collection of pre-designed plans. Our experience in designing custom homes has allowed us to meet and work with thousands of individuals, couples, partners and families just like yourself which many of these designs originate from. There are a lot of things to consider as you prepare to build your new home. Don’t worry — The House Designers® will be with you at each and every step along the way — teaching you the right questions to ask to make your dream home a reality. You’ve come to a trusted company and our customer testimonials show our commitment to honesty, responsiveness and customer support long after your purchase is made. The House Designers® will support you through your entire home building process whenever you or your builder needs assistance. (800) 532-0053. We’d be happy to help you in any way that we can! Receive your plans in 4-5 Days with Free Standard Shipping. * Expedited shipping also available. Free shipping applies to plan packages. Shipping fees may apply when ordering extra sets or material lists after the initial plan package is ordered. Check out our PDFs Now! collection if you need your plans today! * Free Shipping is only available in the Continental U.S.
To ensure all of our customers are completely satisfied, you can exchange your first order for a full credit towards another plan purchase minus applicable restocking fees. Orders must be received within 14 days of the original order and returned blueprints that look used, redlined or copied, are not exchangeable due to copyright rules and regulations. Please note: Reproducibles, PDFs, CAD files, study/review sets and PDF Bid Sets are not exchangeable for any reason. House plans requiring modification customizations are not returnable or exchangeable for any reason. The House Designers® guarantees that our plans are offered at the lowest possible price. Buying your home plans direct from the designer ensures you are receiving the best price available on the web. And if you happen to find a better price and meet the qualifications listed below, we’ll give you the difference AND an additional 5% discount off your plans. We also guarantee the best modification pricing as well. Simply provide us with a copy of your estimate and that price will be matched as well and receive an additional 5% off! To satisfy the Best Price Guarantee offer, you must: Simply provide the information or URL of the lower plan price. 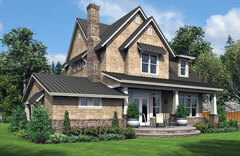 The lower price must be for the exact plan package The House Designers® offers. Our lowest price guarantee applies to the total price of the plan package including shipping, taxes and other charges that apply. Please submit your best price guarantee within 7 days of your house plan purchase to quality. For modification estimates, simply provide us with a copy of your estimate and that price will be matched. Free modification quotes on any of our plans — and a best price guarantee! We offer free modification quotes on any of our plans! To receive complimentary modification quotes and design assistance by our designers and house plan experts, simply email, live chat or call our toll free number (800) 532-0053 and we’d be happy to help you. If you receive a lower price anywhere for modification estimates, let us know and we’ll match it and offer you an additional 5% discount! Regardless of where you end up purchasing your plans, there is vital information you should know before you undertake the biggest investment of your lifetime. The House Designers offers a one-time 14 day exchange policy for non-electronic plan packages for plans that have not been modified, used, marked on or copied — many other house plan websites do not offer an exchange policy. Note: Exchanges are subject to a 20% restocking fee and all sales on electronic files and customization/modifications are final. Read critical information about what you should know before purchasing house plans. There are so many innovative products that you'll want to consider as you select your home blueprints. Most house designs can incorporate the latest high tech products and services like the latest smart home features that allow you to control your home from any location. When searching home plans, think about the products you'll want to incorporate like radiant flooring and wireless sound systems. Most of the time, it's much more economical to incorporate these types of products during construction and not post-construction. Modifying house plans is much easier than you might think. Many of our customer's changes to their house designs are simple red line changes made directly on the blueprint with their builder. For example, changing a window size or placement, or changing a closet to a powder room is a red line change. When selecting your house design plans, look for a plan that needs the least changes. Free house plans are usually a gimmick, but The House Designers offer free modification estimates and will try to find you a plan that needs the least changes to save you money. The House Designers represents the best architects and residential designers in the county and has the highest design standards in the industry for house plan designs. 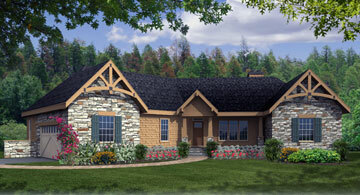 Our house plan blueprints are from custom designs that were drawn for families and couples all over the world. You will find more house plans with pictures than any other website. We also show how a modified blue print can easily be done with lots of pictures showing our customer's modified homes. may be reproduced, stored or transmitted in any form by any means without prior written permission of The House Designers®, LLC. 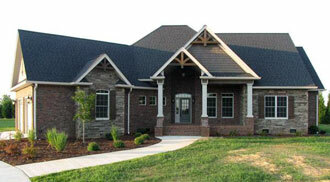 Our award winning residential home designs and ready-made construction blueprints will make your dream home a reality!